Andy Peaks was content with another point on the board after AFC Rushden & Diamonds drew 0-0 at Alvechurch. 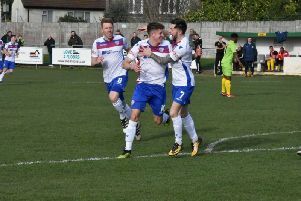 The point kept Diamonds in the top five of the Evo-Stik League South Premier Division Central as they maintained their good form, which has seen them beaten just once in their last seven matches. And the result against an Alvechurch side who also sit in the play-off places was made all the more impressive considering the long list of absentees from the Diamonds squad. Jack Westbrook and Ben Diamond both missed out due to suspension while the likes of Jack Bowen, Liam Dolman, Jack Ashton and Oxford United loanee Matt Berry-Hargreaves were all ruled out because of injuries. And boss Peaks said: “I am happy with the point, if you’d given me that in the morning I would have taken it. “I think a draw on the road in this division is always a good one, particularly against a side towards the top end and to do it without five or six key players is even more satisfying. “Ben Heath has had to make a couple of good saves, which you would expect him to and, if I am being slightly critical, we could have been a bit better in the final third. “But, overall, the way the players performed on this occasion was brilliant. It’s a good point and it keeps us in a decent position. Diamonds now have a two-week break before they are next in action at Redditch United on December 22. They had been due to be back at Hayden Road next weekend but with Stratford Town now in Buildbase FA Trophy action, the match has been rescheduled for Tuesday, January 7. And Peaks added: “You can look at it two ways. “We are in good form so ideally you want to keep playing and you want the games to keep coming.